As we all get back to the daily grind after the holidays, it can be easy to lose those warm, fuzzy feelings we sought and held onto throughout December, in a flurried sea of voicemails, emails and catching up on the loose ends of 2012. But I’ll keep one story in my mind to warm my heart year-round. A story of an ADC angel, who took it upon herself to make the holiday a bit more merry for two little boys in Brooklyn. 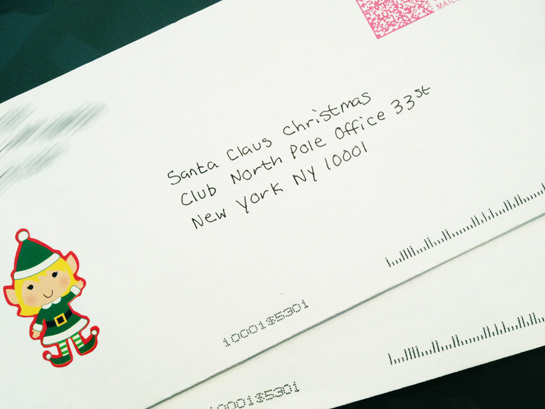 How this letter to Santa ended up at ADC Global headquarters in Manhattan—being that it was addressed to “Club North Pole Office 33st”—we will never know. So we’ll call it fate. “Dear Santa,” it read. “…I am a 7 year old boy and I have a little brother. His two. Santa as you know, we’ve been very good boys…” it continued, as he asked for a few simple toys and more importantly, needed items of clothing. He even added a very politically correct, “P.S. Happy Holidays!” at the end. Ariel wasted no time in assembling a Santa-squad of friends and ADC employees, and this band of elves got to work. In a couple of short weeks, her Santa-squad had collected warm jackets, hats, vests, clothes and shoes for each of these little boys, along with the wished-for LEGOs and toy cars. Enough to ensure that two little boys in Brooklyn will not go cold, or unamused, this winter. Just like my heart. To ensure these items made it under the tree by the 25th of December, Ariel lovingly and painstakingly wrapped each item, boxed them up and sent the entire bundle of Christmas joy to the provided address. 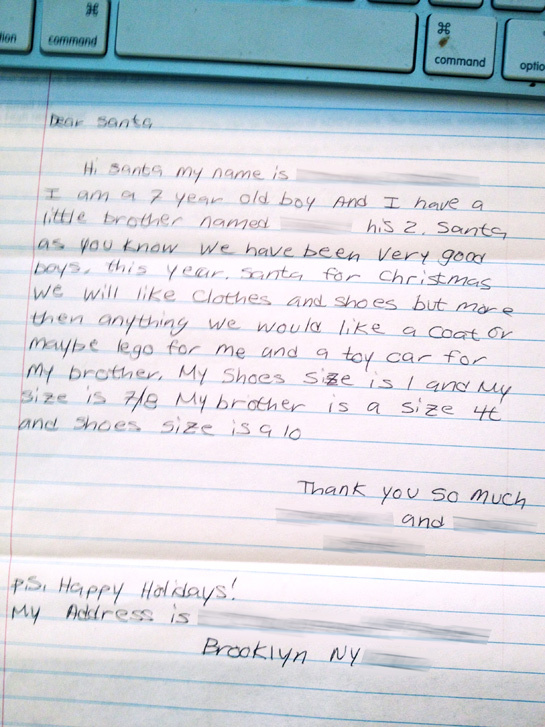 We can only imagine the surprise and excitement of these two boys as they realized that Santa had not only indeed received their polite plea, but that he (/she, or in fact, they) was (were) listening and moreover, that these boys did indeed deserve a reward for a year of good behavior. Something makes me think that the “Club North Pole Office 33st” will be receiving more news from two believers next year. If fate didn’t drop you a letter, but you’d like to play Santa next year, bookmark this link for 2013. Operation Santa Claus allows you to pick up “Dear Santa” letters from your local post office (just enter your local zip code) and fulfill as many holiday wishes as you have the means and heart to do. We know that Ariel and her Santa-squad’s actions brightened the hearts, minds and faith of our two little Christmas angels. 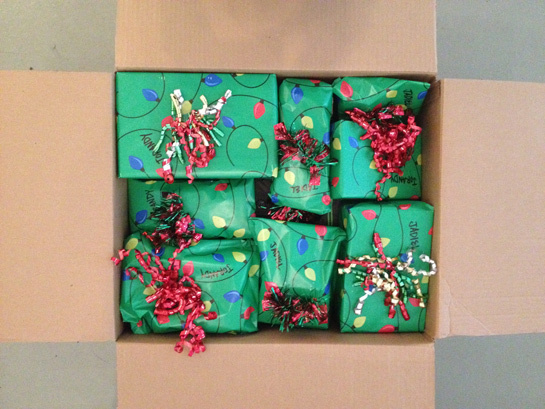 But I hope that these secret Santa’s (who sought no acknowledgement, I just couldn’t help myself) inspire the rest of us to hold a little holiday spirit in our hearts year-round and that this year, we all approach each other with the patience, curiosity, acceptance and gratitude of a child. By Brianna Graves, Director of Content and Communications at the Art Directors Club.